This has been some bee season already. Last year I was still mourning the imminent death of my colony (though it didn’t happen). This season we are, according to a local hive inspector, already in the month of May. Yesterday, finding it suddenly quite warm and seeing all the bees hanging out “on the porch” (the landing board – a good indication that it’s a comfortable temperature for them for a hive opening), I decided to have a quick peek at how they’re doing with the second slab of sugar fondant. I found that the bees had drawn out comb all over in the empty space created by the spacer rim (for the sugar slab) and that they were filling it with honey! Already! So I decided to add on a honey super. Why not? Maybe they’ll finally draw them out and fill them this year. This entailed clearing away all that extra comb, of course, honey included (yum!) and the bees pretty much let me, which tells me they’re not stressed at all. After robbing the wax, I put the super on top, then the spacer rim with the sugar, shook all the bees still on the stolen comb off into the hive, and closed up. 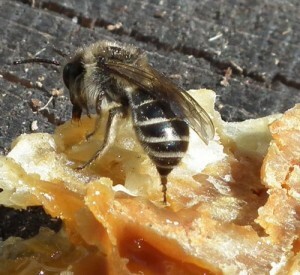 When I was taking the comb out of the container I found one lone bee. She was so delicate, so strange. Look at that sleekness, that stinger. I also I took a video of her. A closer look at the comb revealed eggs. 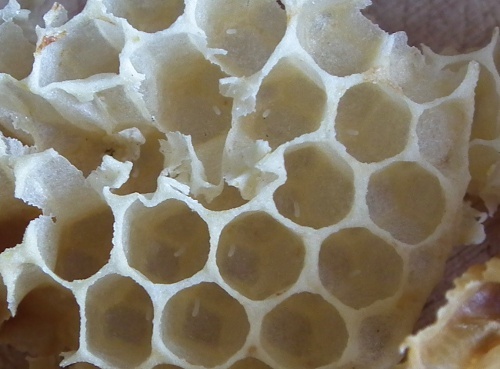 Some cells (not pictured here) have two, even three eggs in them, which might be an indication of a laying worker or a failing queen – good queens lay eggs methodically, one per cell. But last year in the beginning I also observed this, and then I found the queen anyway and all turned out to be fine, so I’m not worried. What did worry me was the fact that the eggs were in comb up in the spacer rim on top of the two nest boxes, so the colony is expanding its nest upwards. I don’t want grubs in my honey supers, so I’ll have to go in again and reverse the next boxes. Possibly there is no nest in the bottom box.